His grace has been sufficient for me indeed. The race is not always to the swift, Nor the battle to the strong, Nor satisfaction to the wise, Nor riches to the smart, Nor grace to the learned. It’s purely God at work in my life. He brought me out of darkness into His marvellous light. All of His own volition. I did nothing to merit His grace which He has bestowed upon me. I didn’t choose Him, He chose me. I am saved by the undeserved grace of The Lord Jesus. I am standing by grace. His grace and mercy are at work in my life. I see how wonderfully kind, tolerant, and patient God is with me and I can’t but bow in worship. This is my story. My testimony. 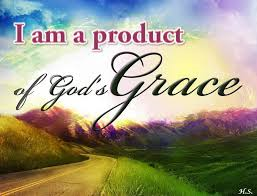 I am a product of the grace of God. May God our Father and the Lord Jesus Christ give you grace and peace.